(Nanowerk News) Magnetic vortex structures, so-called skyrmions, could in future store and process information very efficiently. They could also be the basis for high-frequency components. For the first time, a team of physicists succeeded in characterizing the electromagnetic properties of insulating, semiconducting and conducting skyrmion-materials and developed a unified theoretical description of their behavior (Nature Materials, "Universal helimagnon and skyrmion excitations in metallic, semiconducting and insulating chiral magnets"). 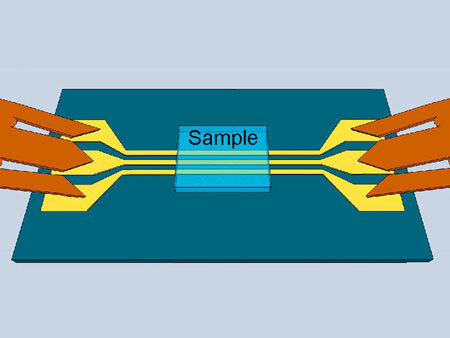 This lays the foundation for future electronic components with purpose-designed properties. More than six years ago, physicists at the Technische Universität München discovered extremely stable magnetic vortex structures in a metallic alloy of manganese and silicon. Since then, they have driven this technology further together with theoretical physicists from the University of Cologne. Since magnetic vortices are microscopic and easy to move, computer components may need 10,000 times less electricity than today with this technology and store much larger amounts of data. Recent research results showed that the unique electromagnetic properties of skyrmions could also be used for the construction of efficient and very small microwave receivers and transmitters. The production of computer chips requires insulating, semiconducting and conducting materials. Today, magnetic vortex structures are available for all these three classes of materials. An important advantage is that these vortices respond easily to alternating fields so that information can be processed at high rates. Now a team of physicists at the TU München, the University of Cologne and the École Polytechnique Fédérale de Lausanne (Switzerland) has examined the dynamic behavior of the three materials. The typical resonance frequencies of the skyrmions are in the microwave range – the frequency range of mobile phones, Wi-Fi and many types of microelectronic remote controls. 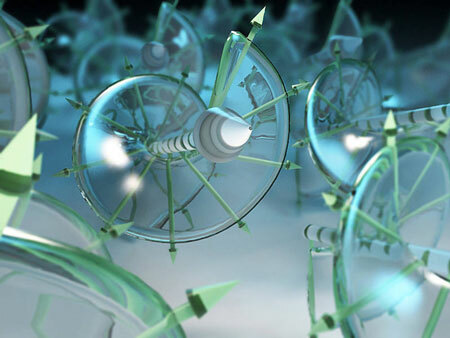 Thanks to the robustness of the magnetic vortices and their ease of excitability, skyrmion-materials could be the basis for highly efficient microwave transmitters and receivers. While the wavelength of electromagnetic microwaves typically lies in the range of centimeters, the wave lengths of the magnetic spin waves, so-called magnons, are 10,000 times shorter. “In the area of microelectronics, much more compact or even entirely new devices could be developed from magnetic nanomaterials such as the skyrmion-materials,” says Grundler. In addition to the material itself, its shape also significantly influences the electromagnetic properties of the device. Here, too, the researchers' newly developed theory is very useful. It can predict which form produces the best properties for which material.